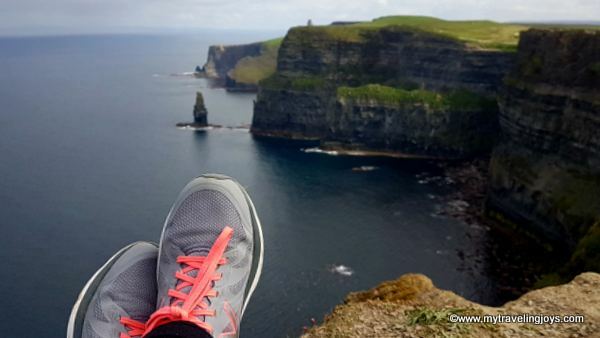 In April, the strong westerly winds whipped across our faces as we stood on the edge of the Cliffs of Moher, a dramatic 5-mile coastline on the west coast of Ireland in County Clare. Here, you will see Mother Nature at her most rugged, panoramic and breathtaking best. The views are incredible, even with a pending rain shower in the distance, which is what we experienced. I guess it wouldn’t be a typical day in Ireland if it didn’t rain. 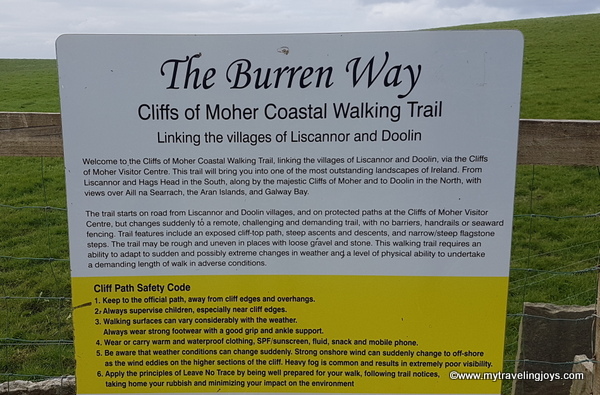 Originally, hubby and I had planned to hike about 90 minutes from the darling village of Doolin to see the Cliffs, but his parents didn’t share our enthusiasm for this idea. Instead, we drove about 15-minutes down some narrow, country roads to the parking lot and went directly to the visitor’s center. From the cliffs edge, we heard the the booming far below as the powerful waves crashed against the rocks. We peaked over the edge, watching hundreds of birds swooping in and out of the cracks of the cliffs. I kept looking for the mysterious Atlantic Puffins who were doing their annual spring migration, but alas I didn’t see any. If you’re into birding, I’d recommend a pair of binoculars. Perhaps, as warned by my mother-in-law, we both attempted to get too close to the edge of the Cliffs. You do need to use extreme caution here! The area is known for its strong gusts of wind and crumbling rocks that have led to some unfortunate accidents. We took these photos so they look convincingly close and I was just far away from the edge that I still felt comfortable. Still, be careful! There also is a well-marked hiking trail along the entire stretch of coastline if you enjoy hiking. 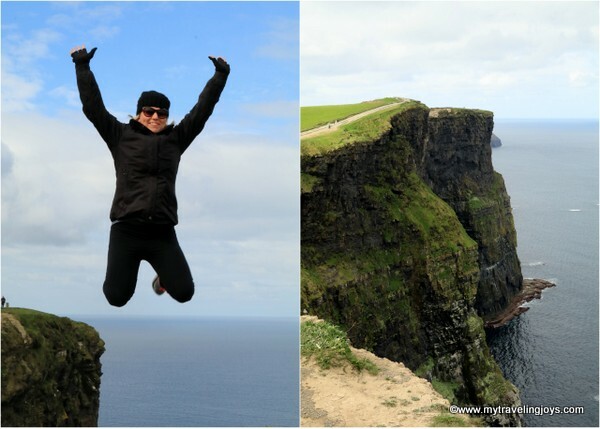 Because the cliffs are so beautiful, it probably wouldn’t surprise you to learn that more than one million people every year visit the Cliffs of Moher, making this one of Ireland’s most popular attractions. Definitely a recommended outing when you visit Ireland! Lodging: We stayed 1 night at the Pairc Lodge in Doolin, which is along the main road to the Doolin Harbour. We paid €85 per room which included a lovely full Irish breakfast with homemade jams cooked by Rita, the owner. The bed and breakfast is perfectly located if you want to hear some Irish music at night in one of the local pubs. breathtaking! no one would have to tell me to not go too close to the edge! this has dredged up a few memories - such a delightful country and as for the Atlantic Coast . . I'd be much further away from the edge that that. @Annie, yeah, possibly a little closer than I should have been. I was there in May 2017 and you're right, amazing! Pictures can't really do it justice can they? I wrote about our visit if you care to take a look at mywanderlustblog.me. We were blessed with an amazing blue sky. We stayed in Doolin as well and enjoyed music at the local pub. Ireland is hands down the most beautiful of my travel experiences!